Fictional Memoir by Eleanor Scott Meyers: "I Don't Know Why I Didn't See that Cloud"
Eleanor Scott Meyers lives in Claremont, California where in her retirement she writes, paints and teaches watercolor and oil painting classes. She has just completed her first novel. Writing fictionalized accounts based on characters from her extended Midwestern family, Eleanor enjoys putting stories together that highlight real people living everyday lives that challenge old stereotypes. That middle of the night call was beyond belief to me. Mother was only seventy-one. But strong, sturdy, Midwestern-people, certainly my people, don’t die in their seventies. Despite our late arrival in Ft. Myers we were up early and off to the hospital hoping to catch the doctor making his rounds. When we entered the windowless room and found Mother lying in that bed I was shocked. One look at her—whatever it was I had been thinking—suddenly it became clear: the saddest thing was going to be if Mother didn’t die. Yesterday morning Dad had told us she had had a severe stroke. The only other thing they had told Dad was that her heart did not seem to be involved. Of course, Mother, the swimmer, the runner, the distance walker had taken very good care of her heart, thank you. In that first moment as we stood there, speechless, the doctor arrived. “Good morning, Mr. Meyers,” the doctor said, finding us there. After the somber greetings the doctor turned to Dad. “Mr. Meyers, I stopped by to see Mrs. Meyers late last evening and was in earlier this morning. 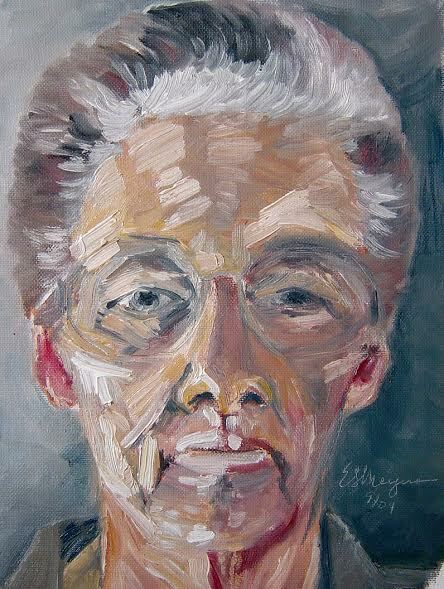 There have been no changes in her condition within the last twenty-four hours.” He paused, turned toward Mother for a moment, then gently placed his hand on Dad’s back and said, “Let’s move to a place where we can talk,” and led the three of us into a private corner of the waiting room just outside the ward where Mother lay. “If there is any change we will be back in touch with you, Mr. Meyers,” he said once again resting his hand on Dad’s back, nodded to the two of us and politely excused himself. Again, we just stood there as if we were afraid to look into each other’s eyes. Soon Dad moved over and sat in a chair along the wall of the empty waiting room. Betty Ann and I followed. We sat there. Just sat, as if deflated balloons totally emptied of air. After a bit I said, “I don’t think we can just sit here. The doctor made a helpful suggestion, Dad. Let’s go home together . . . there is nothing we can do here. “Eleanor’s right Dad, we can’t help Mother by sitting here,” Betty Ann said as she stood, turning toward Mother’s room. Dad got up slowly; the two of us followed Betty Ann. As we circled around the bed, Dad put his hands on her head, one on each side, and turned her face toward him . . . all the while shaking his head while almost shaking hers, “Dorothy! Dorothy, wake up! . . . Don’t you hear me . . . how can this be?” He seemed determined to wake her up. Watching I wished he could be more tender with her. My sister on the other side of the bed seemed a bit horrified at Dad’s behavior. She picked up Mother’s hand; I picked up Mother’s other hand. Her breathing was an awkward rhythm, in and out through her gaping mouth. This was my mother lying here, comatose. I couldn’t think; it was as if I was as paralyzed as she appeared to be. Finally Dad let go of Mother, my sister and I looked at each other, tears in our eyes . . . and nodded. He shook his head, with tears streaming down his face, and bent to kiss her as did my sister. Then I stepped to the head of the bed, put my long arms on either side of her, wanting to crawl over those railings into that bed and just enfold her full body in my arms. Instead I kissed her forehead. Pulling myself away from her, my left hand making its way down the length of her strong, beautiful arm . . . and then I let go . . .
Betty Ann and I took each others’ hand and walked out of that room through the forebodingly dark waiting room to the elevator. Dad was still shaking his head, still looking down at his feet. Betty Ann pushed the button to call the elevator and I took hold of Dad’s hand. When the doors opened the three of us stepped into the artificial, dulled florescent light. I pushed the button for the Main Floor as the doors closed separating us from the view to Mother’s room. Together we walked across the large room filled with lounge chairs and people. Most were chatting in a subdued manner while a few younger giggling or tearful children were working to free themselves from the clutches of adults working to hold them in check. It was just before we reached the swinging door to step through them to the outside, my arm around Dad, my sister a mere step ahead of us . . . a sudden *Flash* and then BOOM! I jumped sideways and almost lost my footing. Dad caught and took hold of my hand. “Got you, didn’t it?” he said as he laughed, a wonderful smile on his face. “Welcome to Florida where a genuine thundercloud is never all that far away,” tickled and with his hand over his mouth, an attempt to hide his pleasure of the moment when his daughter was flummoxed by Mother Nature. My sister, caught in mid-step, inside the rotating doors wore an eyes-wide-open frazzled look. “Are you OK?” I asked, as the doors swept her back into the lobby where Dad and I stood. “Well, I guess so,” she said, rather unconvincingly. But just at that moment, it started to rain. Not only rain. Sheets of rain. A royal downpour of rain. The three of us stepped to the side of the swinging doors to watch a glorious sight that began to subside almost as quickly as it had begun. In the distance we could see the few white clouds amid tons of sunshine but straight up over our heads we could see a single, lone, gray cloud above the palm trees. Then . . . “Look!” I cried out, pointing over the palm trees beyond the parking lot . . . “a rainbow!” Having flown out of snow-filled lands only a few hours ago to arrive at the bedside of my stroke-ridden Mother, it all seemed surreal. The rain stopped, we got to the car, and left the hospital to drive the six or seven blocks back to the folk’s home under a glorious blue sky—less than ten minutes after that flash of lighting, thunder and torrent of rain. We pulled into the driveway. I parked the car under the attached carport. Stepping from the car we all stopped at the back door table. It was full of dad’s most prized seashell specimens. He wanted to show the latest finds Mom had made only two days ago at their favorite beach . . . when I heard the phone ringing. I opened the door. Dashed for the phone. “Is Mr. Meyers there?” a pleasant, professional sounding voice asked. “Dad it’s for you,” I called out into the carport through the open door. He stepped inside, took the phone . . . “Hello!” he shouted, his usual answering-the-phone hard-of-hearing voice. Then his face changed, squeezed into itself, his free hand rubbing back and forth over his bowed forehead, eyes closed working hard to listen. “Yes . . . yes . . . here, I think you should talk to one of my daughters,” he said handing the phone back to me.